So the decorating has begun at my house. . . For those of you who don't know, my husband and I are from Indiana. We spent four years in Milwaukee, Wisconsin but last year we made the big move to Georgia. We love it here, we are the college town of Athens. The only draw back is that we are so far away from our families. It means there is always a big trip to Indiana to see everyone at Christmas. Which also means, we put up a tree and then pretty much leave. I never get to really decorate and that's a shame because I loooooooove Christmas. This year everyone has decided to come to us! Yipee! I am so excited to spend the holidays at our house. So as I said before, the decorating has begun! 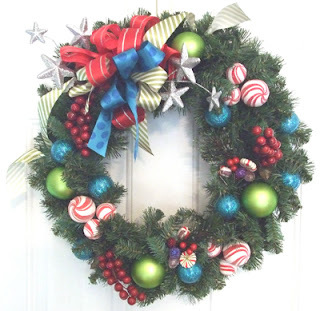 I made this wreath, and a garland that hangs over my door. We have lights galore outside and a big ol' tree inside. I love glitter and it seems that a lot of the do dads and decorations this year are covered in it. This is fine by me, therefore I have bought a lot of glittery things this year. If I could figure out how to get glitter to stay in my glazes all my beads would be covered in it too. Speaking of glitter, my friend Dori who is the artist and owner behind Dreaming Bear Designs has a glitter bar in her store! She offers twelve different colors and styles of glitter to decorate anything you would like. Doesn't that sound fun?